"A Mile Square and All There"
Frederick Eaton (1856-1934), surveyor of the Phillips Tract and the townsite of Covina. A couple of years ago we, of the Historical Society, were surprised and honored by a visit from some of the descendants of the Badilla brothers. As most of you know the Badilla brothers were Costa Rican coffee growers who came to California about 1875 and, with the intention of raising coffee, bought the land where Covina is now not knowing that this area was far too arid for the cultivation of that crop. In 1882, Joseph Swift Phillips purchased most of that land, decided to subdivide it, and established the town of Covina near its center. He hired Fred Eaton to survey the land and lay out the town site. This was completed, the site map was filed, and maps published in 1885. The map had street names written on it, including "Dexter," the name of Phillips's newborn son, and to honor the previous owners, "Badillo" street. But on the map the Costa Ricans' name was spelled Badillo, with a terminal "o" rather than "Badilla" the the last letter "a" as the brothers' name was spelled. 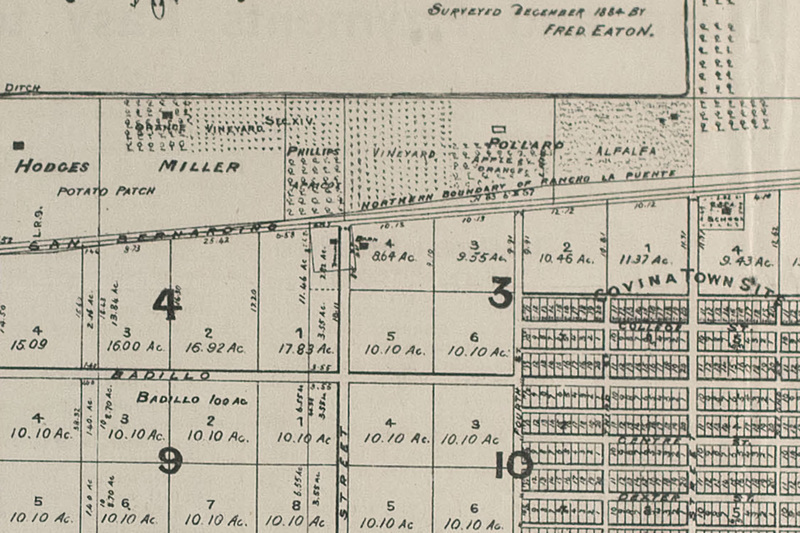 Detail of Eaton's map of the Phillips Tract, showing his spelling of "Badillo" Street alongside a label marking Antonio Badilla's 100-acre plot. Courtesy Glenn Reed and the Covina Valley Historical Society. The Badilla descendants pointed the error out, much to our chagrin. Some time later, I noticed an item on Facebook where one of the Badilla descendants suggested that the error was caused by the historical society. This was impossible, of course, as the error occurred in 1885 and the Society was not founded until 1969. But who was responsible for the misspelling? Mr. Phillips? Looking at his cash ledger from 1885-1886, I found more than twenty places where he entered the name Raphael or Vincent Badilla for work they performed on the water ditch from the San Gabriel River. Raphael and Vincent were two of the thirteen children of Antonio Badilla, one of the Costa Rican brothers. There entries were in Joseph Phillips's own hand and the name "Badilla" was written clearly with the "a" as the last letter. So apparently it was not Mr. Phillips as he used the proper spelling. It must have been Fred Eaton or someone in his office. In any event Fred Eaton must bear the responsibility. Incidentally, Mr. Phillips's Cash Ledger for 1885-1886 is one of the prize treasures of our historical society's collection. Mr. Fred Eaton made a couple of other mistakes in his lifetime and is remembered more for those than for his many accomplishments. He was born in 1855 in Los Angeles. He became superintendent of the Los Angeles Water Company when he was only 19 years old. Of course his uncle owned the company. Eaton hired William Mulholland as a zanjero and quickly moved him up in the company. Eaton opened his own engineering office in 1881 and did the survey of Covina in 1884-1885. He was appointed city surveyor and then elected city engineer of Los Angeles in 1887 (he was the only candidate). Eaton designed 6th Street Park (now knwon as Pershing Square), Elysian Park, Westlake Park (now named MacArthur Park), Eastlake Park (now known as Lincoln Park), and the Plaza. His major achievement was the design of a new sewer system for the city of Los Angeles with an outfall to the ocean. 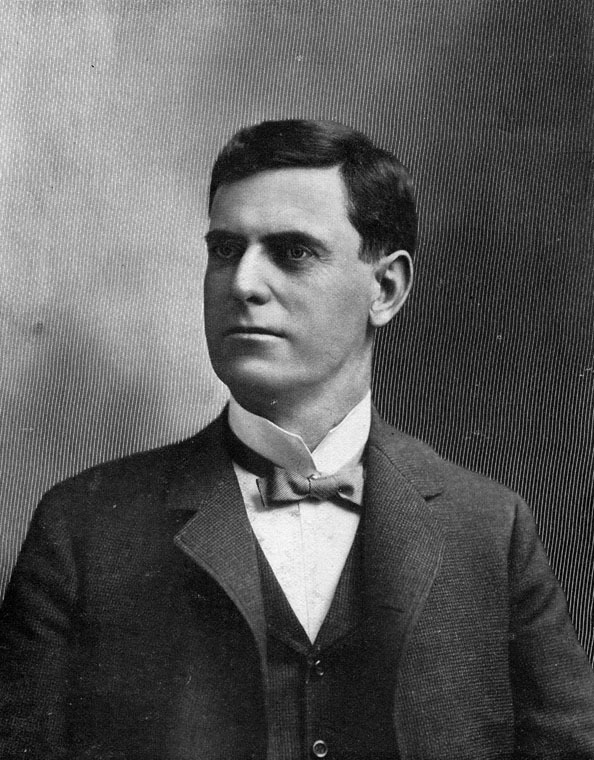 In 1898, he was elected mayor of Los Angeles for a two year term. While mayor he ensured strict enforcement of civil service laws in the city, desegregated the fire department (it was segregated again under the next mayor), created the Los Angeles Water Department, and announced his plan to appoint William Mulholland as superintendent. It was he who convinced William Mulholland that the need for water in Los Angeles could best be satisfied by an aqueduct from the Owens Valley to Los Angeles. For these accomplishments, and many more, he deserves much credit. But later, acting on behalf of the City of Los Angeles, Eaton bought water rights from Owens Valley land owners while letting them believe that he was an agent for the federal government's reclamation program that was for the farmers' benefit. When it was discovered that he was acting for Los Angeles he was considered a villain and is still remembered for the deception. Fred Eaton also bought, for his own account, an area called Round Valley near the Owens River. Some years later, after the aqueduct from Owens Valley to Los Angeles had been completed, William Mulholland felt it would be necessary to build a storage reservoir in Round Valley and asked Eaton to sell it to the city. Eaton asked for an amount that Mulholland felt was exorbitant. Their disagreement destroyed a close friendship of 35 years. Mulholland chose instead to build a reservoir on the Santa Clara River behind a new dam – the Saint Francis Dam. Conversation with Barbara Ann Hall, Ph.D. This article was originally published in the October, 2016 issue of "The Covina Citrus Peel," the official newsletter of the Covina Valley Historical Society, and is reproduced here with the permission of the author, Covina historian Glenn Reed.